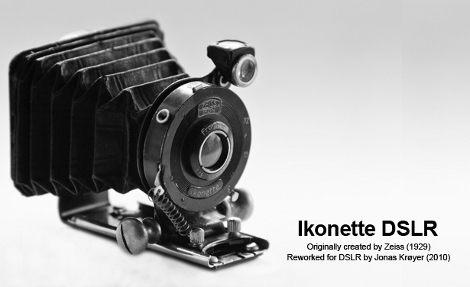 [Jonas Kroyer] is a digital photographer, with a fascination with old cameras and pairing the two together sounded like a fun idea. Searching around on the net he fell in love with the design of the Zeiss Ikon Ikonette (1929-31), and found one with a chipped lens. After dismantling the camera completely, it was found out that he needed the lens/shutter mechanism, the bellows, and the rails that allow the lens to slide back and forth. The bellows were glued to the body of the camera, but some careful prying and they were quickly removed unharmed. Next was to make an adapter so he could attach the lens to a digital DSLR camera, a steel plate and a Nikon Bayonet swiped off of a no name lens holds everything together. Rails were reattached using rivets, and the bellows were glued onto the plate. Other mods include adding small brass knobs to aid in adjustments, and a spring from a ballpoint pen to hold the original shutter open. The new old lens is said to be easy to operate, and produces some beautiful images. Though since the lens does not have any modern day coatings it does have its drawbacks, like a diamond shaped flare in the middle of the image, which can be good when you want it, or partially removed in photoshop if you don’t. you Could just put the lens on a set of macro bellows, then you don’t have to damage the camera. Most of these old folders use retaining rings that you can just unscrew. I did this once with an old broken Goerz Tenax medium format folder and some m42 screw mount bellows. I made a hole in an m42 body cap to make an adapter. i have some large format cameras and nikon camera what is a m42 bellows and body cap? I use an old folder regularly; not that old, it’s a 6×9 Agfa Record III. Bit better lens, but still: there is no way that diamond flare should be there. It’s not because of the lack of coatings or ED glass or anything else. I’d say the chipped lens that he talks about would have much more to do with it! These old triplets took very sharp images when stopped down. And an uncoated lens will produce more flare, yes, but not a weird diamond thing; you simply get more veiling flare. Older uncoated Leica lenses are prized for their rendering and so-called “glow”. Check out the work of James Ravilious at http://www.jamesravilious.com/ who used uncoated lenses with some home-made lens hoods to minimise veiling flare.